For security purposes, the frames shown above are not the actual frames which we recommend. However, the lenses are actual Ultra-Luminous lenses. NU-CONcept only uses high quality designer frames and, if desired, we may be able to manufacture Ultra-Luminous lenses and place them in your sunglass frames. Note: The above photo is not the owner of NU-CONcept. But, they are photos of the actual Ultra-luminous sunglass lenses. Another vendor calls these sunglasses, ink and daub Black Predator. If someone asks to look through your sunglasses, the odds are small that they will not know how to use them to make the marks visible. People will normally put on the sunglasses and look straight through the lens. When this is done, the marks are not visible through the sunglasses. A lot also depends upon how subtle you decide the make the marks. The darkness of the sunglasses is also a security feature because most spectators who may borrow your sunglasses will not leave the sunglasses on long enough to be able to read the marks clearly, even if they accidentally look through the right part of the lens. For added security, matching UN-GIMMICKED sunglasses are available, as an option, which may be switched in your pocket, lap or in the bathroom. ...OR... If you are paranoid, see hybrid sunglass and contact lens option below to reduce risk of exposure to virtually zero. You can take the sunglasses off and lay them on the table with no risk of exposure. Ultra-Luminous (TM) sunglasses filter out slightly different wavelength frequencies than NU-CONcept Luminous Solution and filters. To the onlooker the Ultra-Luminous (TM) sunglasses appear almost black. The wearer of the sunglasses will be able to see the slightly colored gradiated tinted lens. Specifically, these lenses are multi-dipped optical filters specifically calibrated to filter higher wavelength light frequencies than luminous filters do. Gradiated lenses, may be made, allows you to have more control over clarity and darkness when reading the marks, regardless of lighting conditions. Gradiated lenses are lenses which are lighter near the bottom and darker near the top of the lens. In the real world, you do not have control over the light intensity in the room. Therefore, your next best option is to design the filter to be adjustable. By looking through different parts of the lenses you will be able to fine tune the clarity of the marks because of the gradiated lens design. You can look through different parts of the lenses by moving your eyes or simply by tinting your head up and down. 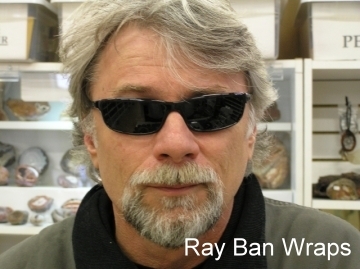 Wrap around frames are included as part of the standard product. This feature prevents light from getting behind the lens while wearing the sunglasses. Wearing a baseball cap (if it fits your personality) will further enhance the readability of the marks by reducing light which may get behind the lens even more. When using Ultra-Luminous technology, your goal is to simulate that you are in a dark room. This is accomplished by wearing the gimmicked dark, wrap around sunglasses (a baseball cap is optional) while viewing the cards on a well lit table. The high price of this product is actually an advantage because it keeps the technology out of the reach of most people, while making it available to serious professionals. Since the Ultra-Luminous (TM) sunglasses are dark, they should not be used in very dim environments. Ultra-Luminous (TM) Shade solution is not very effective when using florescent lights. This is because florescent light bulbs do not produce light frequencies which are compatible with Ultra-Luminous (TM) solutions. Stick with incandescent, halogen or sunlight for best results. If you must work under florescent light NU-CONcept recommends that you stick with NU-Concept Luminous Solution, juice products or supplement the florescent light with another light source. But you may use the Ultra-Luminous sunglasses for maximum deception. 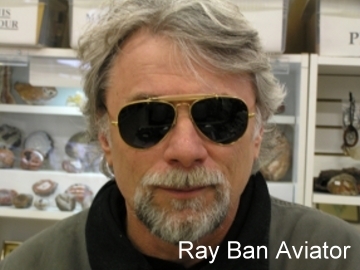 Ultra-Luminous sunglass frames shown in the video clips above are simply an example. Ultra-Luminous sunglasses can be made in a wide variety of designer ophthalmic quality frames. Please contact NU-CONcept for details. There are also extra security features associated with the Ultra-Luminous sunglasses, so if someone asks to look through your sunglasses they will not be able to see the marks unless they know what they are looking for and/or how the sunglasses work. The Ultra-Luminous Sunglasses and the Luminous Enhancing Sunglasses BOTH look like normal sunglasses while they are being worn. But, the Ultra-Luminous sunglasses may be tossed on the table or lifted on your forehead and they look perfectly normal. On the other had, the Luminous Enhancing Sunglasses must be worn all the time or switched (in your pocket, lap or bathroom) for the duplicate un-gimmicked pair if you need to take them off and lay them down. In addition, since the two technologies are different, even though they are related, the sunglasses are not interchangeable because they use different filters, solutions and daub/dust. NOTE: Other Video clips will be available shortly using other name brand cards and using Daub/dust. Do you want a private demo before you buy ? While PayPal is accepted for all other NU-CONcept products, Ultra-luminous is sold differently because the purchaser will be placed directly in contact with the inventor for the private demo and/or final sale. Private demonstrations can only be done in New York or a meeting can be set up with the inventor who is in the mid-west. A private demonstration costs $500 (you also must pay for travel costs). If you purchase the sunglasses, the $500 demo fee will be fully applied towards your purchase. However, if you decide not to purchase the sunglasses, the $500 fee is NOT refundable. If you would like a sample Ultra-Luminous marked card mailed to you, simply send $200 which will be applied to the $500 (non-refundable) demo fee. During the live demo or after you purchase the product, you will be able to view this same sample card through the Ultra-Luminous Sunglasses and see the marks "magically" appear. This type of arrangement is common practice for this type and quality equipment. It also further protects the secret from curiosity seekers. This $500 demo fee is not subject to negotiation. Therefore, NU-CONcept strongly advises that only serious purchasers inquire. This demonstration option is to allow serious buyers the opportunity to witness the system in action and to make sure that your can read the marks easily. Due to the high price of this product and since it is hand manufactured by the inventor. Please contact NU-CONcept directly to work out the details of the sale. The $2,100 price includes the Ultra-Luminous Sunglassas and a (Ultra-Luminous marker OR daub/dust). Purchase price for matching UN-GIMMICKED sunglasses is $250. Have anyone bring their own playing cards. You will not care because NU-CONcept daub/dust may be used to make "ad-hoc" Ultra-Luminous marked cards using a borrowed deck while people are watching. Note: There is a daub/dust available which produces 10%-20% darker marks. There is a $100 extra charge per gram for the "darker formula". Note: The Ultra-Luminous daub/dust is shipped in a 2 gram vial. 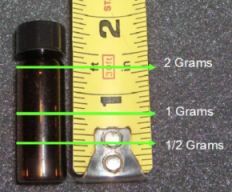 Therefore, 0.5 grams will only fill one quarter of the jar, 1 gram will fill half the vial, etc. (**) You will be able to mark 30 - 50 decks per gram depending upon the size and intensity of your marks. Video Ultra-luminous (TM) Shade (sometimes called video juice) is also available. But, because of the high price, it will only be discussed with serious buyers. Video Ultra-Luminous (TM) is ONLY visible when using a camera and CANNOT be seen with the naked eye, even with filtered sunglasses. Video juice will only be demonstrated by the inventor using a similar "pay to see" strategy discussed above - demo costs will always be applied to a purchase and is non-refundable if you don't buy. As you can see Ultra-luminous is designed for the true professional who wants the "best or the best" and can afford it. Note: Since it is likely that Ultra-luminous is too expensive for most customers, NU-CONcept suggests using the NU-CONcept luminous marker ($109) and gimmicking your own sunglasses (included) OR use the NU-CONcept optional Luminous Enhancing Sunglasses ($99 for existing customers) on paper based playing cards for the majority of it's customers who don't want to use Juice. NU-CONcept solutions have been evolving for over 25 years and offers the finest solutions on the market.